Beautiful ethnic Indian temple jewelry necklace set. This imitation jewelry piece is very traditional in appearance. Red and green color stones embedded in the necklace set are highlighted with pearls. Whether you're searching for traditional jewelry for a special occasion or just want to add a splash of color, this jewelry set is just perfect for any type of outfit. This set is also perfect for dance. Wear them to suit your own style, or give them as a gift to someone special. Product Care: Avoid contact with water. After each use, wrap it in a soft cloth or tissue. This item in Traditional Necklace Sets category was first added to our catalog on 12-07-2013. Buy Ethnic Indian Temple Jewelry Necklace Set, sold & shipped by Ahaarya where you can shop online for Latest Fashion Indian Dresses, Sarees, Salwar Kameez, Kurtis. 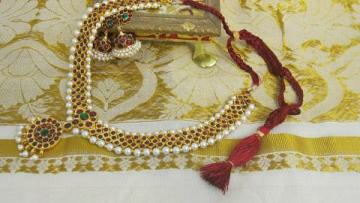 This Necklace Sets collection has been tagged as Ethnic Jewelry, Fashion Jewelry, Indian Jewelry.